The shopping mall was opened in 2007. The mall contains 170 shops and 30 restaurants. There is also designated office space in the building. 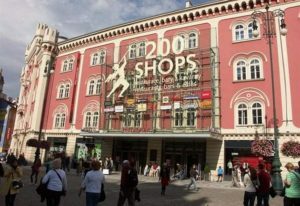 It is one of the biggest shopping centres in the Czech Republic. It is directly opposite another shopping centre Kotva Department Store. The site where Palladium stands was under control of the Army until being sold in the 1990s. Construction on Palladium was announced in June 2005, with a projected completion date of autumn 2007. The new design has retained the facade of the previous Josef Barracks building. During the construction process, a number of medieval ruins were found underneath the construction site in an archeological excavation. The remains were removed but not before they were recorded and photographed.